Synthetic marijuana is a weird and confusing drug. Here’s what you need to know about it. Everything you need to know about fake weed. A man prepares to smoke K2, a type of synthetic marijuana, along a street in East Harlem in New York City on Aug. 5, 2015. 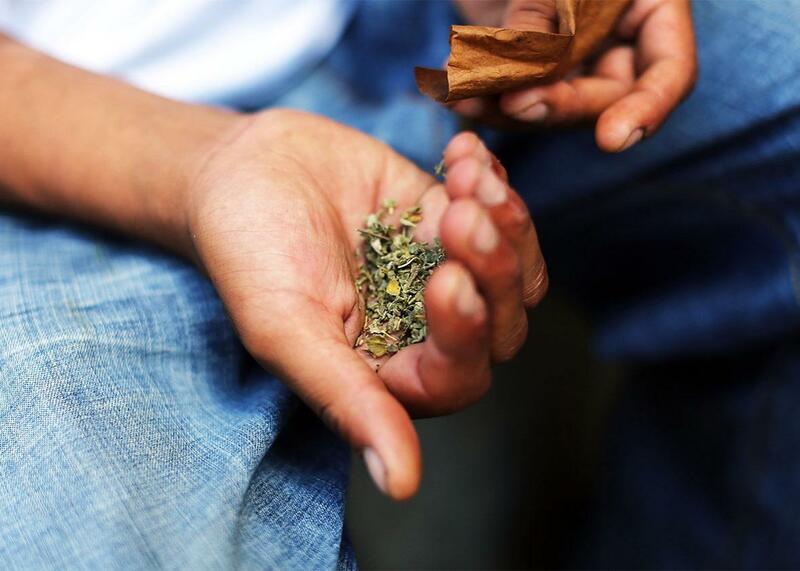 On Thursday, the New York Times reported on a sharp uptick in synthetic marijuana overdoses. The Times reports that “over three days this week, 130 people across New York City were treated in hospital emergency rooms after overdosing on K2, almost equaling the total for the entire month of June.” Back in February, Leon Neyfakh wrote a comprehensive guide to synthetic marijuana, explaining how the drug differs from the real thing and what makes it so dangerous. You can read his original story below. Off the sports pages, you might have seen a story about a group of senior citizens in Pennsylvania who got arrested for running a synthetic marijuana trafficking ring worth more than $1.5 million. Or perhaps you saw the one about a pair of brothers in Milwaukee, ages 12 and 13, ending up in the hospital after smoking some fake pot and having a violent reaction that included foaming at the mouth, “throwing up white mucus,” “talking funny,” and shaking. These are only the latest data points showing the rise of synthetic marijuana as a staple of recreational drug use in America. Against the backdrop of softening attitudes toward actual marijuana, synthetic weed has attracted a strange coalition of users, including athletes, curious teenagers, and desperate homeless people. Here’s a primer on the drug whose ambiguous legal status and unpredictable side effects have turned it into a bleak cultural phenomenon. What is synthetic marijuana, and how is it different from normal weed? The most important fact to understand about synthetic marijuana is that it isn’t just one thing. It’s more like a category of things, a family of man-made chemicals that have one major characteristic in common: They interact with the same cell receptors in the brain as THC, the active ingredient in natural cannabis. In theory, someone could ingest these chemicals in any number of ways, but manufacturers play up the association between their products and traditional marijuana by spraying their chemicals onto diced-up dry plant matter that can be sold in baggies and smoked. Where did synthetic cannabinoids come from, and how long have they been around? When did people start manufacturing synthetic marijuana as a recreational drug? Products based on Huffman’s formula started popping up on a large scale in Europe and the United States in 2008 and 2009, according to the United Nations Office on Drugs and Crime (see p. 23-24). I’ve heard of Spice and K2. Are those the same thing? They refer to the same kind of thing, yes, though there’s a huge amount of variation when it comes to what’s actually in this stuff. Other names that have been used to market synthetic cannabinoids—and there are literally hundreds—include Bliss, Cowboy Kush, and Scooby Snax. They are almost universally embarrassing—and therefore, attractive to dumb young people—especially in conjunction with the doofy images of dragons, smiley faces, and cartoon animals that are used on the packaging. How much does synthetic marijuana cost? It’s cheap, which is a big part of the draw. You can find it in bulk online, where it costs in the neighborhood of $50 per ounce. In smoke shops and convenience stores, smaller packets are priced as low as $10. How do synthetic cannabinoids make people feel? It depends on the chemicals used to make them, plus how large a quantity of those chemicals gets sprayed on by the manufacturer. (According to a Time story from 2014, the “crude way in which producers spray the chemicals … can create hot spots where the concentration of the chemical is dangerously high.”) Side effects of smoking synthetic cannabinoids—or maybe just effects?—include catatonia, profound anxiety and paranoia, nausea and vomiting, elevated heartbeat and blood pressure, seizures, and hallucinations. They also seem to be addictive and, according to the Centers for Disease Control and Prevention, have been linked to acute kidney failure. Synthetic marijuana has also been linked to multiple deaths, including 15 in the first four months of 2015. That sounds dangerous. Is the media just trying to scare me? It’s definitely more dangerous than regular marijuana, which has mellowing properties that synthetic cannabinoids don’t have. While drugs like heroin and methamphetamine cause far more deaths in absolute terms, the number of emergency room visits involving synthetic cannabinoids does seem to be growing. According to the Substance Abuse and Mental Health Services Administration, there were approximately 28,531 emergency room visits involving synthetic cannabinoids in 2011, two and a half times more than in 2010. (More recent data are not available.) That’s a drop in the bucket compared with the nearly 2.5 million emergency room visits in 2011 that were linked to all drugs put together, but it’s not nothing. And the user base for SCs seems to be expanding: In 2010, SAMHSA’s data indicated that the number of emergency room visits linked to SC use among people older than 30 didn’t reach a measurable level, but in 2011 it did. You make this drug sound terrible. What do people like about it? Different people use it for different reasons, but one of the main sources of its appeal is that it’s hard for authorities to prove that using it or manufacturing it is illegal. The decreased risk of arrest and prosecution makes synthetic marijuana cheaper and more widely available than other drugs. This is because testing for a drug requires knowing exactly what you’re testing for, and the huge variety of chemical compounds used to manufacture synthetic marijuana makes this extremely difficult. The result is that synthetic cannabinoids have attracted an unusual coalition of users. That group includes the homeless, who gravitate to it because it’s cheap and long-lasting, as well as athletes (both college and pro), soldiers, and parolees, who like it because it allows them to get high without having to worry about failing their mandatory drug tests. Why is it harder for authorities to deal with synthetic cannabinoids than other drugs? So is the drug-enforcement cat just totally powerless against this synthetic-marijuana mouse? Not exactly. The single best weapon that law enforcement has for dealing with the whack-a-mole problem is the Federal Analogue Act, a section of the United States Controlled Substances Act that was passed in 1986. The Analogue Act gives prosecutors the power to pursue drugmakers and distributors who traffic in substances that are “substantially similar” in their chemical makeup and their pharmacological effect to Schedule I and II drugs. So that makes not-quite-illegal substances de facto illegal by virtue of their similarity to substances that are illegal? Yes, except there are a few catches. First, proving that two substances are “substantially similar” is hard, because the definition of “substantially similar” is on some level subjective. That makes the process expensive, because prosecutors have to enlist expert chemists to conduct tests and testify in court against experts hired by the defense. Prosecutors must also prove that their defendants knew that what they were selling was substantially similar to an illegal drug. Is that why baggies containing synthetic cannabinoids are often marketed as “herbal incenses” or “potpourri,” or say that they’re “not intended for human consumption”? I’ve heard some people argue that legalizing marijuana—or just being more tolerant of it in contexts like sports—would result in fewer people using synthetic weed. Is that true? No one really knows. It’s definitely true that some users say they use synthetic cannabinoids as a substitute for the real thing. In a big New York Times Magazine piece from last summer, an addict was quoted saying it was a “miracle drug” because it didn’t show up on drug screens, but that nobody he knew would choose it over real weed. Similarly, NFL stars like Chandler Jones likely wouldn’t turn to it if they didn’t have to worry about drug testing. But there seem to be lots of people who like SCs because they are cheap, powerful, and long-lasting, qualities that actual marijuana might not be able to match. Should I try synthetic cannabinoids? No! What makes this drug a special case legally is also what makes it terrible recreationally. Ingesting it to get intoxicated only makes sense if you don’t care about what kind of intoxication you get, or how you’ll feel or what you’ll do once you get it. No matter what “brand” you buy, you’ll have no idea what you’re putting into your body. And while that does mean it’s possible nothing bad will happen to you if you use synthetic marijuana, it also means it might.